Amazing level of gloss, depth and protection! Lasts up to 2 years! As of 6/1/18, EXOv4 replaced EXOv3. The Gtechniq EXOv4 Ultra Durable Coating is a semi-permanent paint coating that will protect virtually any surface of your car! It is the latest technology to help protect your paint for years and enhance the appearance. EXOv4 is a reformulation of the popular EXOv3. 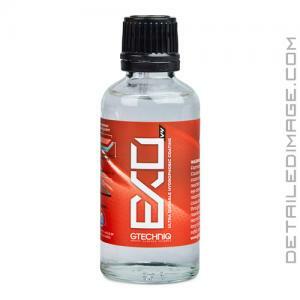 EXOv3 performed exceptionally well in various areas, but a few things stuck out to detailers and Gtechniq noticed that there was room to grow and take this product to the next level. Gtechniq worked hard and sent various samples directly to Accredited Detailers for some real-world testing and feedback. Hundreds of samples were sent to these to detailers all across the world in areas like Asia, Europe, Scandinavia and North America. After this first-hand testing, Gtechniq compiled all of the feedback and got to work and the results are the incredible EXOv4. The first thing you notice is the EXOv4 is incredibly easy to apply and remove. It is a non-hybrid formula comprised of two parts, an inorganic base coat and an organic top coat. The base coat is a chemically bonding hard coat that bonds directly to the surface with which it is applied. This top coat is very slick, wet looking and is also highly dirt and water repellent. The hard film makes water-spots easy to remove, offers great resistance to all wash chemicals, road salt, and can help withstand micro-marring. You will be amazed at how glossy, slick to the touch and ultra-hydrophobic this coating is. Water will bead up in small drops and run off your paint with ease! EXOv4 stands up to UV rays and everyday elements for up to 2 years! It can be used on all painted surfaces including clear coat, matte finishes, enamel, single stage paint, wheels, chrome, and stainless parts and trim. 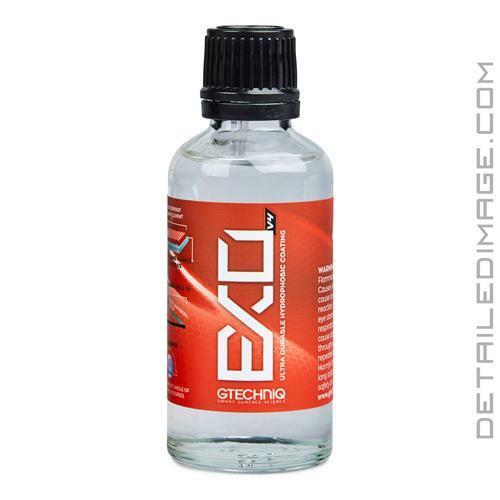 Protect your paint with ease with the Gtechniq EXOv4 Ultra Durable Coating! Easier application. Working time for the product is a bit longer meaning even easier application time. The latest version of EXO is Gtechniq's best yet. EXOv4 offers extreme hydrophobic function to the surface of your car, making it a dream to maintain, even in the harshest of weather conditions. Gtechniq EXO is phenomenal. I've not seen a more hydrophobic, slick, reflective coating. It goes on easy and polishes off with minimal effort. Again, and I can't say it enough, EXO creates intense reflectivity! This product is wonderful I applied it with CSL and after I applied it I can see more gloss and the slickness was incredible. I've drove my car around in storms all week and it still look amazing. Dirt and water was just coming right off bug don't stick at all. Fantastic stuff. This is the second coating I've tried. I put CQuartz UK on my personal vehicle last year - the gloss was great, as well as the hydrophobic properties, but after winter it seemed gone. I just applied EXO V3 to a customer's vehicle based on all the great reviews, and I absolutely love the product. I was able to get two coats on the paint AND glass of a GTI with half the bottle, and I purposely went heavier on the second coat! The application is very easy, although tedious (I like to be as precise as possible). I used CarPro's CQuartz applicator and a suede cloth for application based on other suggestions, and I'm glad I did - I feel I can be much more precise than with the round applicator they provide, but that's just me. After it cured, I did the water test, and wow! After pouring a gallon of water down the hood, I was able to count 9 beads that remained on the hood itself. When the customer left, it was raining, and it had VERY tight, perfect beads. Can't wait to see how it holds up. New GTechniq fan! As always, excellent customer service! Thanks again Greg!